The editor in chief of America, Drew Christiansen, S.J., has forgotten more about Catholic social teaching than I’ve ever known—and he’s not forgotten much. So I urge you to read his commentary below on the pope’s new encyclical on social justice and the economy, Caritas in Veritate. Our former editor, Thomas J. Reese, S.J., also has a good roundup on Newsweek’s On Faith blog. And of course, we’ll be covering in our magazine, in greater depth, the encyclical, in future issues. But I wanted to meditate a bit on a particular aspect of the encyclical: its implicit critique of capitalism. 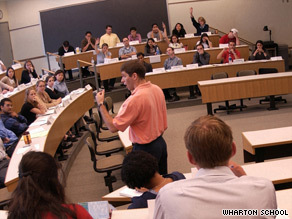 And I’d like to do so as a graduate of the Wharton School of Business (B.S. Econ, '82) and someone who worked for GE and then GE Capital (1982 to 1988). In other words, as a capitalist, or at least a fan of capitalism, the system I believe is the most efficient distributor of goods and services and wealth. Benedict’s new encyclical, Caritas in Veritate, is already being spun by more than a few free-market Catholics as an endorsement of the capitalist system, or, likewise, “Nothing here, move along.” I’m always amused that a few of the same Catholics who trumpet the pope’s (either John Paul II's or Benedict XVI's) clearly “countercultural” stances--particularly when it comes to abortion, stem-cell research and other life issues--are so willing to look the other way when the culture being countered is free-market capitalism or rampant consumerism. And if you have any doubt that the pope is offering a critique, read the document. Certain words recur over and over: solidarity, justice, poverty, common good—all things that capitalism, or at least capitalist thought, has traditionally elided. The market, says free-marketers, will provide for those things through the smooth and efficient operation of the economy. But, as we know, it does not. Just ask the poor. (There are billions to ask, both here and abroad.) Capitalism may be--to paraphrase Winston Churchill on democracy--the worst form of economic distribution, except for all the others that have been tried. I’m still a capitalist, but--as were his predecessors, Leo, Paul and John Paul II--Benedict is absolutely right, and within his “rights,” to offer a strong critique of the capitalist mindset. Look at just one of B16’s comments. It’s Number 36 in case you want to check. That statement would have caused my Econ 101 professor to run screaming from the classroom. Benedict says, in essence, that the market cannot provide for everyone. And, given that it cannot, something else must be seen as an essential value: the common good. There are values other than simply the creation of wealth. And those values must be incorporated into our calculus of what "works." Adam Smith, says Benedict, is only partly right. Here’s just another area of critique. In classical economics, there will, economists suggest, always be some “residual unemployment,” the result of those workers shifting from job to job. And as for the poor, well, they are not “efficient” in that they are poorly educated or trained, or perhaps they are not diligent in seeking employment, and so their poverty will serve as a goad for them to become better trained, more highly educated or simply more motivated in the future. So both problems—unemployment and poverty—are more or less a given in the free-market system. But no matter, the market will correct them, eventually. Being Catholic does not mean being a capitalist. Of course it does not mean being a Communist or a Socialist either. The Catholic church rightly critiques certain gross failings of the capitalist system, not because the system itself is evil or contrary to the Gospel, but because it fails in many respects to maintain the dignity of every human being. When in the Gospel of Matthew, Jesus tells us that we will be judged by how we care for the “least” or our brothers and sisters, he was speaking, primarily, of the poor. Benedict’s new encyclical reminds us that the caritas that Jesus was talking about is often not provided by capitalism. And so it is appropriate that the church point out this truth, this veritas, whether or not it makes Catholic capitalists, like me, uncomfortable. Fr. Jim, good job connecting the dots for those who would rather you not do so. Benedict's comments on the redistribution of income will also give some capitalists fits. What the Pope says about the value of people as gift is also brilliant. Recognizing that genius can come from anywhere and anyone - so all must be developed - is an improvement on anything that has been said before by the Magisterium of the Church on this issue. I invite you to look at the essay on Pay Equity from my web page for similar material. Capitalism just like socialism is not moral. Morality is in the heart of the individual. It is ridiculous to think otherwise. Salvation is individual. We are saved by a victim who died on the cross. We are not saved by the economic system we have devised. The Pope, as pastor of the Catholic Church, is concerned with the salvation of the individual members of this church. Any political or economic system that purports to feed the poor better than any other system will not save one soul. Jesus himself said that we would always have the poor among us. I don't think Benedict means to contradict Jesus on this and, of course, his great encyclical says no such thing. No system of politics will ever eradicate material poverty. What seems to be more troubling to Benedict is the spiritual poverty of so many, and too much of a this-world focus on everything which is a major flaw of the present Society of Jesus. I have to say I was utterly unsurprized to read that Pope Benedict thinks cutthroat capitalism is flawed, because it is. Terribly. However, I also think many ideoloies that sometimes find themselves cast as the opposition to the fiction* of "free market" capitalism similarly are on the Holy Father's bad side. They need to heed the the Pope's teachings about the value of subsidiarity (ie, trying to govern things on the lowest feasible level for the item in question); linking justice and love/charity; being cautious of making others dependant on material charity; condemning equating material prosperity with development; using charity to export or impose ideology or experiment on the poor (eg Population control); compromizing ethical and moral standards in the name of "development" (eg various bioethical travesties); paternalism toward impoverished countries; the incapacity of secularism to lead to authentic human development; a bunch of other points I am forgetting as I am doing this from memory; And Indeed, the central point of the encyclical: Above all, authenitic Human Development is inexorabbly linked with engaging people as wholistic realities and anything less is neither Just, True, or Loving. Looks like we all have ample room for improvment. Neither capitalists nor socialists nor conservatives nor liberals should be smug right now. The aforementioned, myself included, need also be careful while analyzing the Holy Father's words to see what is there, not what they want to see there. *there is always some regulation, otherwise a market is not possible since there would be no way to trust anyone to make good on their agreements.